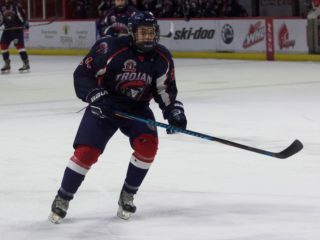 (Marc Smith/DiscoverMooseJaw) Tristin Langan’s hard-working mindset was adopted by the Moose Jaw Warriors this season and played a key part in the team’s success in the regular season. Langan finished his four-year career with the Warriors last week with the team’s first-round playoff exit. The 20-year-old said it was a great run in Moose Jaw. Langan’s final season with the Warriors was a special one as he put the team on his back throughout the season offensively. He finished with tied for the league lead with 53 goals and second in the WHL with 113 points. Both those totals more than doubled his career marks entering the season as Langan started this past season with 25 goals and 71 points in 174 career games. The Swan River, MB product said that he developed so much as a player and a person during his time with the Warriors. “I came a long way on the ice, but also off the ice, I became a man here,” said Langan. Langan was on a mission right from the start of the season, posting points in seven straight games to open the season. He had almost matched his career goal total by Christmas, posting 24 goals in the first half. Langan never went more than two games without a point during the season and he was only held without a point in 12 games in total. He finished the regular season on an eight-game point streak. The rest of the team followed Langan’s lead which propelled them to a surprising 40 wins in the regular season. “That was one of the funniest years of junior that I’ve had,” said Langan. Langan hasn’t made a decision on his post-Warriors career yet. Brodan Salmond finished off his Western Hockey League career with his best season. 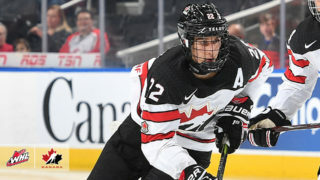 After three years with the Kelowna Rockets, the Calgary product was added by the Warriors before the season and put together a strong campaign splitting time with 18-year-old Adam Evanoff. “This season was awesome, I can’t say enough about this organization, I had a ton of fun and made a lot of lifelong friends, so it was great,” said Salmond. 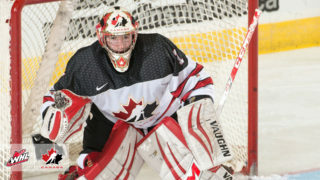 Salmond appeared in 37 games for the Warriors, posting career-best marks in goals against average (2.73), save percentage (0.906 percent), and wins (21). He said working with Evanoff helped push him throughout the year. 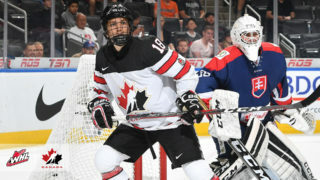 Evanoff added that he’s taking a lot away from his season with Salmond, “I love that guy, he became one of my best buddies, he taught me so much, I know he’s going to have a great future and couldn’t have been more proud to call him my goalie partner,” he said. Salmond said helping the Warriors put together a surprising regular season was something that he’ll remember for a long time. With a lot of players eligible to return from this year’s team, Salmond said he’s interested to watch them grow moving forward, “They’ve got some good young guys in the room, a lot of rookies this year that will take the next step next year into being veterans and leaders, so the team’s going to be good going forward,” he said. Salmond hasn’t decided what his post-WHL career looks like yet. The Warriors had a lot of big names in their defensive group this season with Josh Brook, Jett Woo and even 16-year-old first round pick Daemon Hunt. Dalton Hamailuk fit right into that group, developing into a key shutdown defenceman for the Warriors. Hamailuk finished with four goals and 23 points, both career highs, in 66 games this season for the Warriors. He played some big minutes against the other team’s best players. The Leduc, AB product said that he hopes he left an impact with the younger players around him during this season. “I brought intensity and some of these guys, they look at that and the way I play physical and hopefully some of these guys can bring that into their game moving forward,” said Hamailuk. Hamailuk joined the Warriors after being released by the Spokane Chiefs. He said he didn’t know what to expect entering the season, but enjoyed every moment of the season. Hamailuk is now starting the next stage of his hockey career as he joins the ECHL’s Fort Wayne Komets.